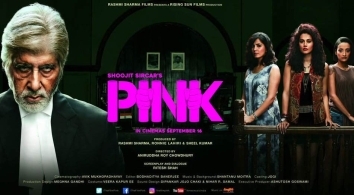 Shoojit Sircar’s PINK is essentially a simple story about the complex problems issues like inequities and hypocrisies the women in India face everyday. The film starts off with a ‘tensed up’ introduction of Meenal Arora (Taapsee Pannu), Falak Ali (Kirti Kulhari) and Andrea (Andrea Tariang), alongside the ‘silent’ introduction of retired advocate Deepak Sehgal (Amitabh Bachchan). Meenal, Falak and Andrea live together as paying guests in Delhi, earning their respective livelihoods. These girls lose their smiles and peace of mind because of a terrible incident that threatens their lives. The incident takes place when Rajveer (Angad Bedi) forces himself upon Meenal and she hits him hard with a glass bottle injuring him seriously. After this incident, the girls come under attack from all sides as Rajveer happens to be a polticians nephew. Soon his friends start threatening the girls. When the incident gets registered with the police, it leads to an array of investigations, interrogations and character assasination of the three girls. With no lawyer ready to represent their case, the girls find their sole ray of hope in advocate Deepak Saigal, who volunteers to fight their case, despite having given up his law practice. How will the girls prove their innocence against such a powerful opposition and does advocate Deepak Saigal help the girls win the case and clear their names, is what forms the rest of the film.